Time spent outdoors in this warmer weather brings rosy cheeks, wind-tousled hair and sun-kissed skin - nature's way of highlighting our beauty within. Like us, seasonal produce needs no further embellishment: its beauty and flavor are best enjoyed in simple preparations that highlight the produce itself. Inspired by the juices dripping down my chin from a strawberry rhubarb gourmet ice pop I recently enjoyed at my local farmer's market (and a serendipitous encounter at Goodwill that yielded a good-as-new Braun Juicer for only $3.99!!! ), I wanted to experiment with the essence of these seasonal flavors in a special dessert. My rhubarb plant is currently in its adolescent phase - a few tall, slender stalks have burst forth from the earth. There's not enough to fill out a pie yet, but there is the perfect amount to extract that bright, tart taste. I liked the idea of tarts too - individual desserts filled with a creamy strawberry-rhubarb curd that encourages lingering with one's spoon. I was happy to discover that one can make a curd out of any fruit juice, and loved the subtle peachy pink colour that came through in this version. 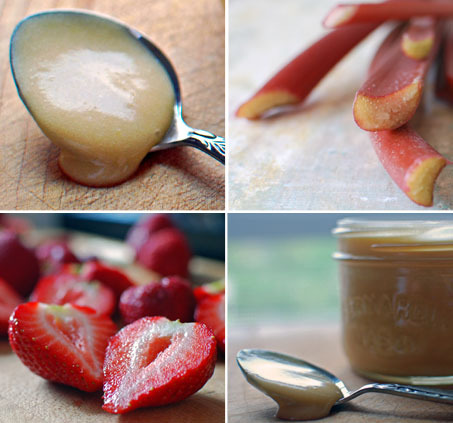 Rhubarb and strawberries are juiced (or pureed in a food processor and strained) and combined in a double boiler with an indulgent amount of egg yolks and sugar. Vigilant whisking is important when making a curd, to ensure the egg doesn't scramble and cook on the bottom. Heaping tablespoons of soft butter are folded in, while curious spoons and fingers seek samples. While the curd cools (I found it essential to continue to taste it frequently to 'check the temperature'), the pastry is brought together. 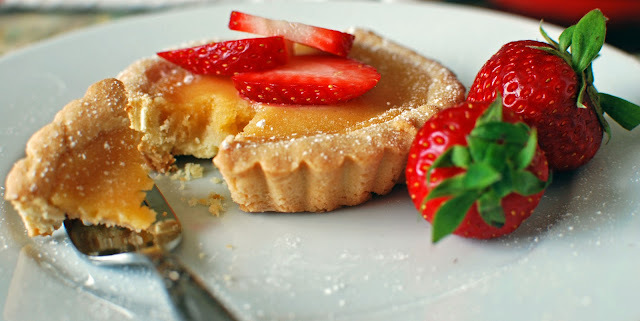 For these tarts, I decided on a pâte sablée - the richest (and sexiest) of the French short pastry crusts. Icing sugar is used instead of granulated sugar for a smoother, sandier crumb (sable is French for sand), while softened butter ensures even distribution and a melt-in-your mouth texture. This pastry recipe also had an additional ingredient technique that was new to me - a hard-boiled egg yolk is pressed through a sieve, whisked with a raw egg yolk and vanilla, and added to the dough to further enhance the flavor and texture. The dough is silky smooth, and very soft, making it a bit tricky to roll and lift onto the tart molds, but any cracks are easily pressed together and healed. 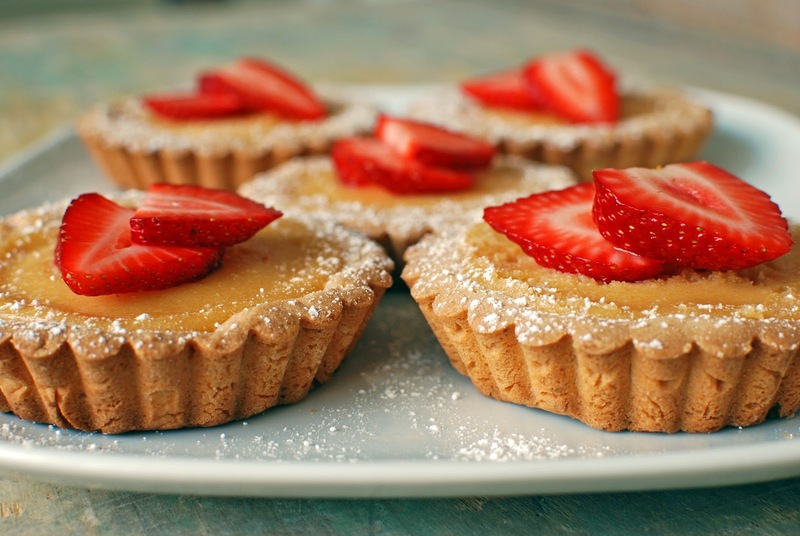 The tarts shells are pre-baked until lightly golden in a 325 F oven, filled with the creamy curd, and baked for a further ten minutes or so, or until just set. "I compare a pastrycook who makes good colifichets to a distinguished fashion designer, endowed with perfect taste, who can make charming things with very little material. In the same way, out of almost insignificant scraps of pastry, we have to create pleasing and graceful things that also tempt the appetite." 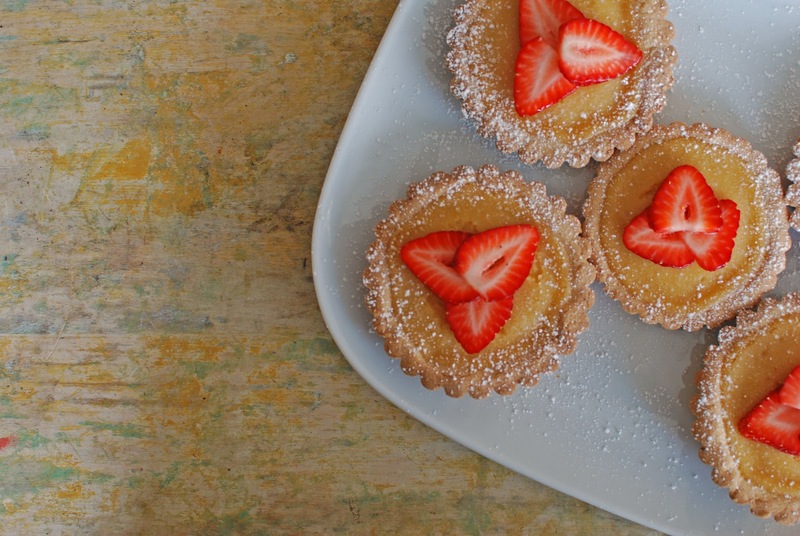 Prettily plated, the tarts are topped with a fan of freshly sliced strawberries and a dusting of confectioner's sugar - simple, beautiful, and unbelievably delicieux! 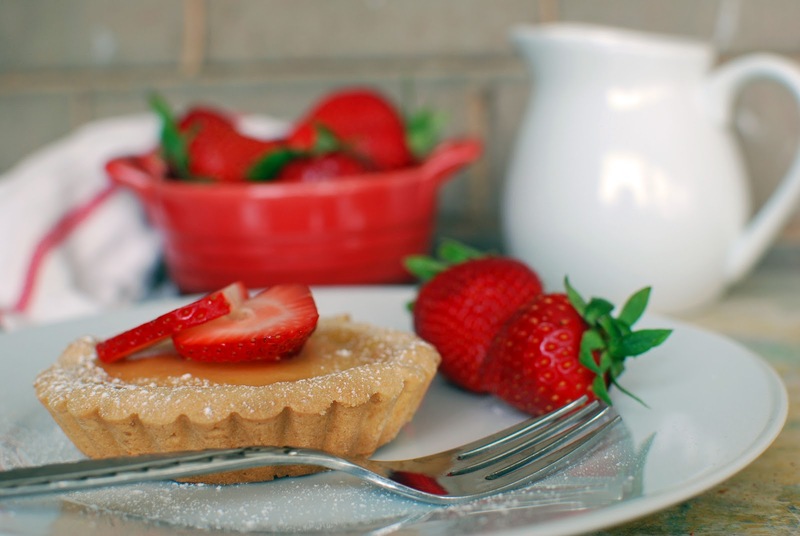 You can taste the sweet courtship of strawberry and rhubarb in this creamy curd-filled tart - perfect for sharing with those you love. Juice the rhubarb and strawberries (if you don't have a juicer, you can simply puree the fruit in your food processor and strain) - you should have just under a cup of liquid, depending on the size of your fruit. Combine juice, sugar, egg yolks, eggs, and salt in a medium-sized stainless steel bowl. Fit over a pot with simmering water and whisk until the mixture is thick enough to coat the back of a spoon, or until you can make an imprint of your whisk in the mixture (about 20-30 minutes). It is important to keep whisking, as the eggs can easily cook and curdle. Strain, and set aside to cool. Cream together butter and confectioner's sugar, using stand mixer or electric beaters, until smooth. Press hard-boiled egg yolk through sieve and combine with raw egg yolk and vanilla. Add to butter mixture and combine until smooth. Add flour, mixing until just combined. Lightly press dough together and shape into a disk (it will be quite soft). Wrap in plastic wrap and refrigerate for 30 minutes (can be refrigerated for longer, and also frozen for up to three months). Lightly flour a work surface and gently roll out dough to 1/4" thick. Carefully lift and press into 6 individual tart molds (or a 9" tart pan with removable bottom if you'd like to make one large tart). Use the rolling pin across the top of each tart to remove any excess dough. If the dough rips, simply press together to patch. Using a fork, dock the dough on the bottom and sides. Line each tart with parchment and weigh down with pie weights or uncooked beans and bake at 325 F until lightly golden (approximately 30 minutes). 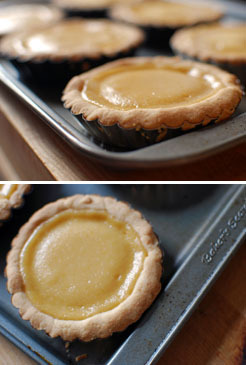 Reduce oven to 300 F. Remove tarts from oven and fill with curd, using a spatula to smooth the tops. Bake for an additional 10 minutes, or until crust is golden and filling is just set. Your desserts are just amazing, hands down. I love the transformation of strawberry-rhubard flavors into something so delectable. These really do remind me of ones at a Parisian pâtisserie. Anyone who has stopped by for these is very lucky indeed! Feel free to stop by ANY TIME, Kat! ohh this looks delicious! yum! Your pies look so beautiful. They are beautifully done and decorated. Too bad, I can't find rhubarb here, otherwise I'd like to test your recipe! Thanks Christine :) I imagine you have all sorts of delicious tropical fruits and other ingredients in Malaysia though that we can't get fresh here - like Pandan - I've never heard of that before! I LOVE the way you wrote about food. It feels indulgent just to read it, and my mouth is certainly watering. Let's have a baking date soon!!! Yes, let's - I'd really like that! Toronto in July after the Festivals are done and we'll catch up. 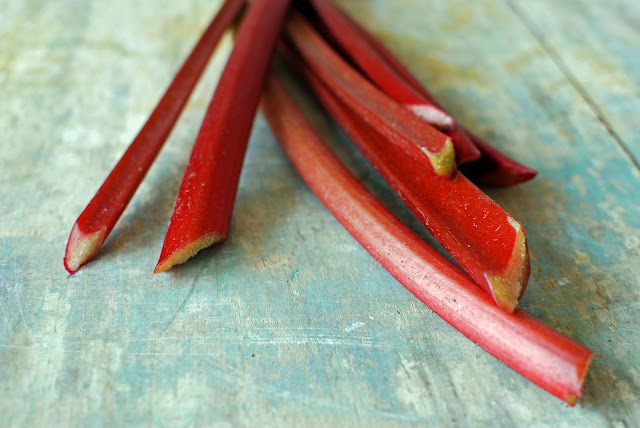 Hugs x Now what to do with that rhubarb i just got? Hi, I am your newest follower. This is a lovely berry dish. Berries and currants are this week's subject for Food on Friday. Would you be happy to link this in? We are looking to create a fantastic collection of berry dishes. This is the link .